Gold and silver may get all the glory, but platinum is still plenty valuable. Do you have any platinum pieces in your collection that you don’t actually wear very often? Have you inherited some platinum jewelry that’s simply not your style? Don’t just leave the platinum items tucked away in a cardboard box or in among your everyday jewelry – bring them to Pawn Big Palmdale ! We accept all kinds of platinum jewelry – of any age or condition – and we’re prepared to give you an amazing cash offer on the spot. You’ll be able to walk out with cash in hand and a spring in your step when you come to Pawn Big Palmdale today. Ready to sell or pawn your platinum jewelry and/or watches? We’re prepared to offer you top dollar in cash for all your platinum jewelry. All you have to do is bring your platinum items to Pawn Big Palmdale and let one of our expert appraisers evaluate them. Then we’ll make you an offer based on the amount of platinum involved, not the condition of the items. We base our appraisals off of the objective value of the items, so you can be confident that you’re going to get the best possible price at Pawn Big Palmdale . No matter what age or condition your items may be in, you’ll get top dollar for them at Pawn Big Palmdale . You’ll get the best price for your platinum items, even if they’re damaged, at Pawn Big Palmdale . Gold and silver get so much attention, but you definitely shouldn’t neglect platinum items in your search for jewelry and watches to bring to Pawn Big Palmdale . You’ll be able to turn them into cash within minutes – but only when you come to Pawn Big Palmdale . 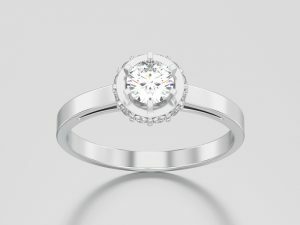 Lots of people try to sell their platinum jewelry and watches online or at other, less reputable stores. But at Pawn Big Palmdale you can trust us to provide you a high level of service and optimal courtesy. Plus there’s no faster way to get the money you need and want today! Whether you need to pay some bills or go on a shopping spree, you can have plenty of money in your pocket right away when you bring platinum items to Pawn Big Palmdale . 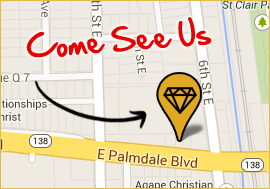 Pawn Big Palmdale is conveniently located in Antelope Valley at 557 East Palmdale Blvd. Palmdale, CA 93550. Business hours are Mon-Fri 10AM-6PM. Got questions? Feel free to give us a call at 661-224-1999.